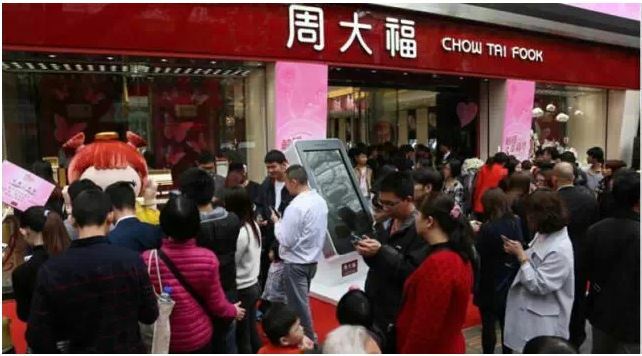 Chow Tai Fook’s beacon deployment business promotion reached a related sales amount of more than $16 million US dollars (>100 million RMB) over the Chinese New Year sales period. A total of 24,694 vouchers were claimed and 20,562 (>83%) of them were redeemed. The data was shared by the Chow Tai Fook (CTF) GM last week. During the 2015 Chinese New Year, the beacon-based proximity market received a major boost as WeChat (number one smart phone social app in China) entered the beacon market. More than 1,000 stores across mainland China deployed beacons and adopted proximity-based digital marketing. CTF (the largest jewelry brand in China) teamed up with Sensoro (the largest beacon provider in China) to deploy beacons in 237 CTF stores (~10% of their more than 2,300 stores). The beacon deployment brought CTF more than 16 million USD in revenue. Sensoro worked together with CTF on deployment and proximity marketing, covering business data, business modeling, comparison with other promotion tools and analysis of market trends. The promotion period lasted from February 6th to March 13th. There were 237 stores in the Beijing, Shanghai, Shenzhen and Guangzhou areas which deployed beacons. There were 32,712 customers who participated during the activity's time period, with a total “Shake” count of 152,325. The average “Shake” count per customer was about 4.76. Among them, 37.22% customers used “Shake” one time; 37.17% customers used “Shake” 2~4 times; 15.56% customers used “Shake” 5 ~9 times; 9.92% customers used “Shake” 10~99 times; and the other 0.13% used “Shake” more than 100 times. From the data, we can see that ~37% of customers were interested in the activity and used “Shake” 2 ~ 4 times, while ~26% customers were significantly motivated by the activity and used “Shake” more than 5 times. There were 34,633 vouchers given out; among them, 24,694 were claimed by customers and the claim rate was 71%; the voucher redemption count was 20,562 and the redemption rate was 59%. This number sits far higher than the average redemption rate (<5%) of other promotion tools such as paper coupons. The total redemption voucher value was more than 100 million RMB (~ 16 million USD). After recording significant revenue gains, CTF chose to deploy beacons in all its more than 2,300 stores in April. The iBeacon was introduced by Apple in 2013 to be used for proximity information communication with apps. After iBeacon's release, many brands in retailing started to leverage beacon devices in proximity digital marketing. The common proximity digital marketing business model includes 3 roles: brands, beacon service providers and beacon aware smart phone apps. Brands who deploy beacons in their stores can communicate with customers who have installed a brand app or other beacon network app. The notification (typically a voucher) will show on the app when the customer enters the store or area of the store based on the geo-fence are configured on the cloud service provided by the beacon service supplier. Chou Tai Fook: The number one jewelry brand in China with leading annual sales in the mainland China jewelry market for years. CTF jewelry mainly engages in retail, wholesale and manufacturing operations. It has more than 2,300 retail stores in China, 10% of which were engaged for the time period. WeChat: The most widely used smart phone app in China. With more than 600 million downloads, WeChat dominates the smart phone social app market in China, installed on pretty much any smart phone in China. 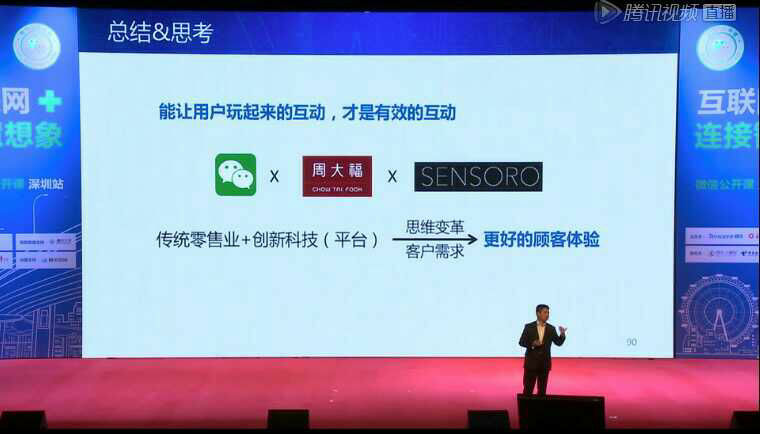 Sensoro: The number one beacon provider in China. More than 70% of beacons deployed in China are Sensoro hardware. Sensoro provided the beacon hardware, configured the beacons, and integrated the beacons with WeChat, providing detailed data analysis for CTF based on the Windows Azure Cloud service, which is one of the most stable and reliable cloud platforms available. In beacon-based proximity marketing, the initial deployment cost is not high. However, the crucial make-or-break point for brands is to get customers to install apps which can detect beacon devices. The promotion cost of getting customers to interact with a compatible app can be high. Without enough app users, the beacon-based digital marketing promotion cost can be higher than the output, so getting customers to interact with an app is key. In China's beacon-based proximity market, the app installation issue was largely resolved when WeChat got involved. Because WeChat’s market leadership has already educated customers on the “Shake” feature, mainland China retailers have no need to promote app downloads. Instead, retailers are able to focus on providing attractive coupons and leading customers to shake their phones to receive them. The beacon service provider’s job is to help shops deploy beacons, integrate coupons into WeChat’s coupon system, and provide consultant services based on the collected data. WeChat is a social app rather than a brand or an app specific to beacon networking. There are three reasons why using this social networking app is very effective with iBeacon technology. Firstly, the coupons are not “pushed” to the customer, but rather “pulled” by customer with “Shake” function of WeChat. The “pull” process is described as below. WeChat uses the “Pull” model instead of “Push” model as common proximity function. Because WeChat is a widely used social app, WeChat does not use a push notification with its users as it might hurt user experience. For more information on WeChat interaction with iBeacon technology, visit http://walkthechat.com/wechat-ibeacons-why-it-doesnt-work-and-how-to-fix-it/. In resolving the app issue for markets outside of China, there are other social marketing apps that can be used. With Facebook’s new feature “Place Tips”, for example, users can enable/disable the proximity-based notification manually. 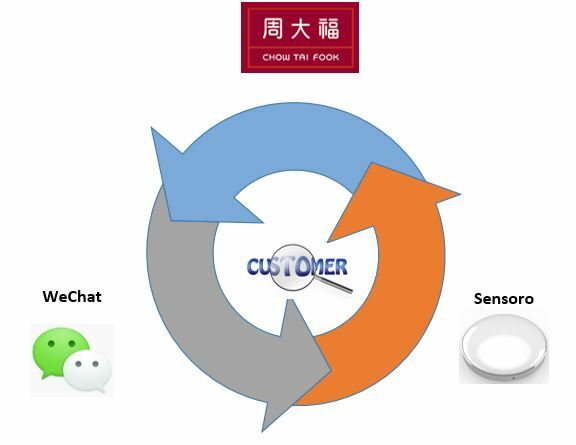 It is hard to say what app has the best way of connecting to iBeacon, but the WeChat “Shake” model is a proven success. In the CTF case study, it was noted that when a customer is surrounded by others who are shaking their smart phones, he or she is often also motivated to use “Shake”. This is one result which silent notification pushing can’t achieve. As multiple “Shake” actions can lead to different coupons, more than 60% customers were motivated to use the “Shake” more than one time, which also increased the participation rate. Secondly, the coupon is mapped to each beacon ID instead of being based on a geo-fence. Multiple beacons in one area can provide an elaborate geo-fence effect, but the deployment and the configuration costs are high. It is hard for WeChat to adapt to the geo-fence feature as it is too complex for it and for the average customer, at least in its current phase. So in WeChat’s coupon mapping system, one beacon ID can only map to one URL. The beacon service provider can change the coupon content by changing the Html5 page content of the URL. With current deployment, in general, one store will install 2 ~ 5 beacons based on the client location's size and all beacons will map to the same URL. It simplifies the configuration and deployment and has also left much room for improvement. Thirdly, enduser information is hidden by WeChat. Because of security constraints and business model requirements, WeChat won’t release enduser information to brands and beacon service providers. Instead, WeChat only provides a unique User ID to brands for each end user. Brands are only able see if the same enduser has repeated “Shake” the phone in its store, but do not receive information like the enduser's name, gender, age etc. On one hand, this protects enduser’s privacy making it more comfortable for the enduser to use; on the other hand, it also limits brand and beacon service provider customer data analysis ability. Good customer experience comes from suitable offers delivered with good timing. The proximity “Shake” achieves better timing than other promotion tools. In contrast to traditional print coupons, the proximity “Shake” doesn’t waste paper or require a person for distribution. Beacon deployed coupons lower costs, and according to the CTF case study, have much higher redemption rates (59% in this case) than paper coupons (<5%). Compared with QR code promotion, the proximity “Shake” provided a more interesting and flexible interaction for CTF customers. From the customer “Shake” count, it is apparent that most customers used “Shake” multiple times to search for different coupons. Additionally the “Shake” function can be done anywhere inside the store without having to directly face a QR code. With this flexibility, brands can innovate on coupon promotions. For example, one restaurant used a “Cut-in-Line” coupon. If a customer got the “Cut-in-Line” coupon, he or she could go to the front of the line rather than waiting. “Shake” function motivates customer participation in a way that QR codes are not able to. WeChat’s proximity “Shake” feature has significantly changed the China beacon-based proximity market. An increasing number of brands are adopting or planning to adopt the proximity digital marketing. Here are some trends we have noticed about beacon deployment in China. CRM and loyalty program integration: The proximity “Shake” allows coupons to be delivered at precisely the time a customer is looking for a discount. However, beacons cannot themselves determine a suitable offer for the customer because of a lack of background information on the customer. In order to deliver the right deal to the right customer, a customer profile, purchase history and willing list are needed. The integration of the existing CRM and loyalty program is important to creating the right customer experience. Because WeChat does not disclose user information, there are some difficulties that need to be overcome. Single Beacon positioning to multiple Beacon positioning: Currently, the majority of retail deployment broadcasts a single type of coupon throughout an area, but there is increasing demand for different coupons to be broadcast within a single locality. For example at car exhibition, the exhibition might need not only to broadcast an exhibition coupon for whole exhibition grounds, but also to broadcast separate coupons for specific cars in various areas of the exhibition. In addition to exhibition beacons deployed to cover the entire area, beacons can be installed on each car with signal range set to about <3 meters instead of the normal 30~80 meters. Triangle localization would be a solution for these requirements, but its more complex design is unfortunately a challenge to integrate into WeChat’s current system. Production deployment: Increasingly, beacon deployment gets moved from the Proof Of Concept (POC) phase to the enterprise deployment phase. In enterprise deployment, the deployment comes from the marketing department and is driven to the IT infrastructure department. The IT infrastructure department needs enterprise-grade beacons to minimize maintenance costs, making beacon battery life more and more important. Sensoro has CR2477 powered Yunzi Beacons and 4xAA batteries powered SmartBeacon-4AA Beacons. The Yunzi is smaller in size and more aesthetic, but the SmartBeacon-4AA has four to six times Yunzi’s battery life. For their initial order, 50% of customers purchased Yunzi, but with increases in deployment volume, the number decreases to about 20% because of battery life preferences. Beacon battery level collection is another crucial part of the beacon maintenance costs. As Sensoro beacons can broadcast battery level and Sensoro provides E2E central Beacon battery level management system (for more information visit http://blog.sensoro.com/ibeacon-battery-management-challenges-and-sensoro-solution/), Sensoro provides practical solutions in this area. Social apps enter proximity market: WeChat is the most widely used social app in China, and its proximity feature has boosted the beacon market. It is proven that social apps can impact the market drastically. Facebook is also working on its proximity feature, and it is hoped that when it is released, will it also boost the beacon market in the EU and US. The original Chinese report can be found at https://mp.weixin.qq.com/s?__biz=MzA5MDI1NzM5NA&mid=205331305&idx=1&sn=227aebd14105b75ff95f030d0e835c5e.